This is a social story about making good choices in attempts to decrease aggressive behaviors. 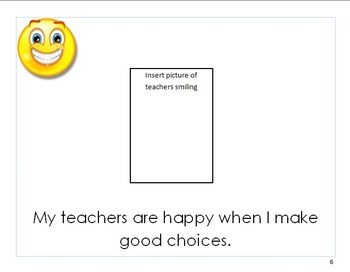 For the "good choices" there are suggestions of what pictures to put in with your actual student. For the "bad choices" there are cartoon photos showing what-not-to-do. Putting in photos of your actual student allows them to take on the role of making good choices. This provides for a more positive learning experience. 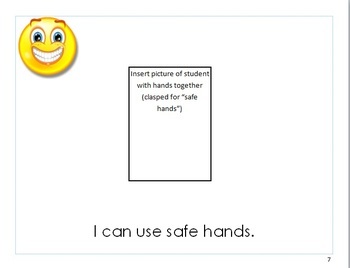 If you do not want to put in pictures of your actual student, I have a similar story with all clip art images in my store!